This is the largest family of flowering plants. They have tiny flowers closely packed into a compound head, surrounded by bracts. They can be divided into three main groups: those like the thistles that have disc florets only; those with a disc in the centre surrounded by rays, like daisies; and those with ray florets only, like dandelions. The thistle group includes one of our most-feared farmland weeds, the creeping thistle. 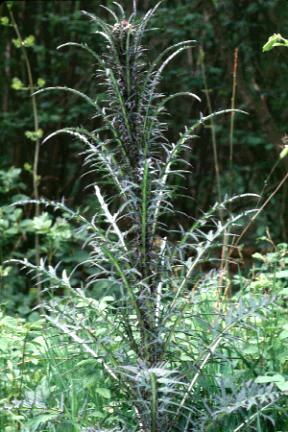 Others, like the marsh thistle or the spear thistle, are both less of a threat and more decorative. All of this group are valuable as nectar plants but among the stars are hemp agrimony which is irresistible for butterflies, and black knapweed, which bumblebees love. The familar ox-eye daisy is typical of the daisy group. Others, like yarrow, have clusters of much smaller flowers. Some, like common fleabane have yellow rays rather than white, as does common ragwort, another feared farmland weed because it is toxic to livestock.